Today is a super awesome and special Secret Recipe Club day – we’re all posting about tailgating foods!! When I first learned that there would be a special theme day all about tailgating recipes (aka, my favorite food group), I was so excited, so I’m thrilled that reveal day is finally here. I think that maybe even causal blog readers/Instagram and Twitter followers can see pretty easily that I am a diehard Pittsburgh Steelers fan. I have been counting down the days until the season starts since the Monday after the Super Bowl (10 days to go! ), and I’m so ready for it to finally be here. One of the most fun parts of watching football is snacking on yummy food, and all throughout the year I have my eye out for new gameday snacks to try. For this special edition of the Secret Recipe Club, I was assigned Tara’s Multicultural Table, written by Tara, a wife and mom who has lived in some pretty amazing places! Her love of travel has extended to the kitchen, and on her blog, she shares delicious recipes inspired by cultures from around the globe. I can’t wait to try her Honey Lime Chicken Enchiladas, Cookies and Cream White Chocolate Mousse, and Lemon Pikelets. 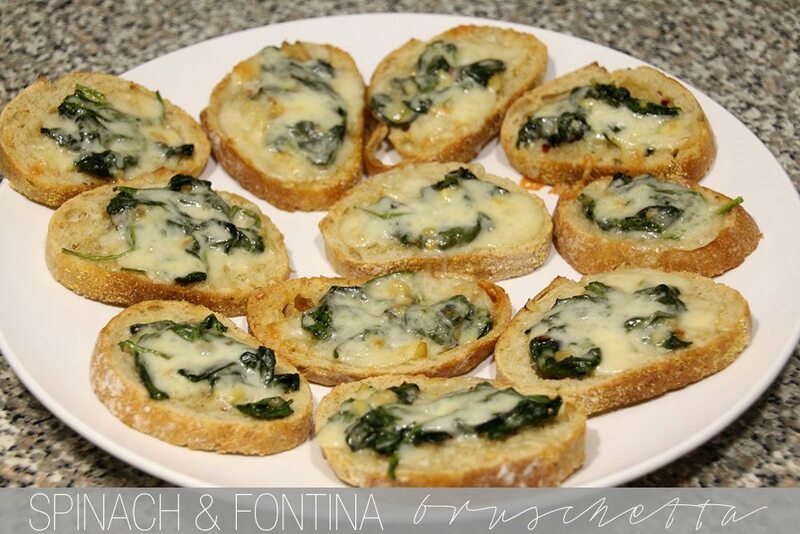 For a tailgating recipe though, I was so excited to try this Spinach and Fontina Bruschetta recipe! I already had a bag of spinach in the fridge, and I knew this would be the perfect way to use it up. 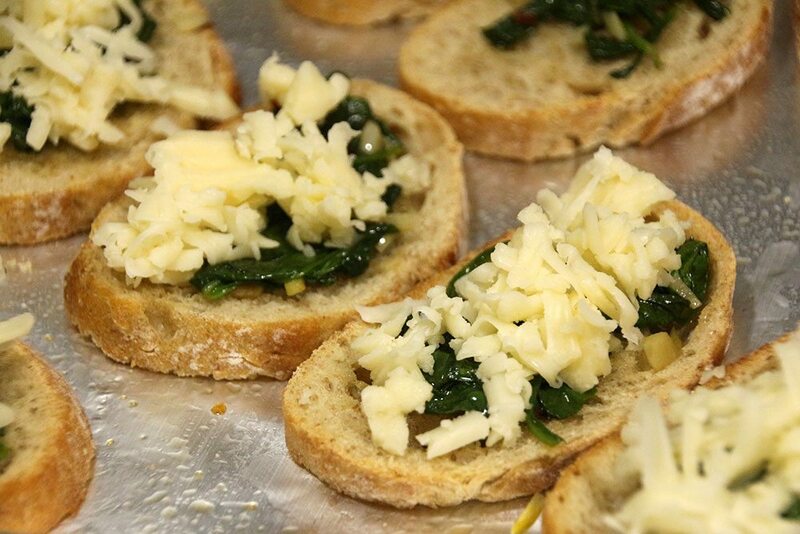 TJ and I both love bruschetta, and truth be told, we ended up just eating this for lunch one day. I mean, it was seriously THAT good. I loved all the garlic in this recipe, and the slight heat from the crushed red pepper was just perfect. I will absolutely be making this again when the regular NFL season starts, and I hope you will too! 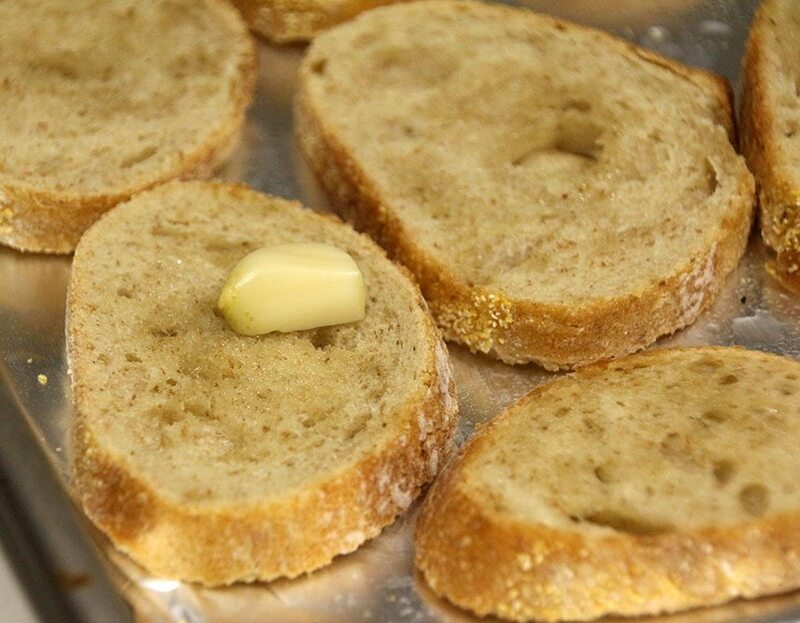 Cover a baking pan with foil, and lay the bread slices in a single layer. 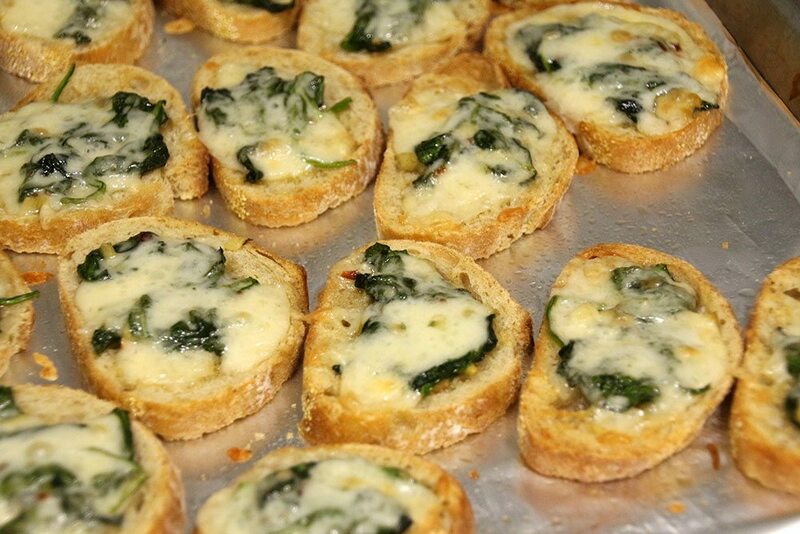 Drizzle each slice with olive oil and bake at 400 degrees for 10 minutes, or until slightly toasted. 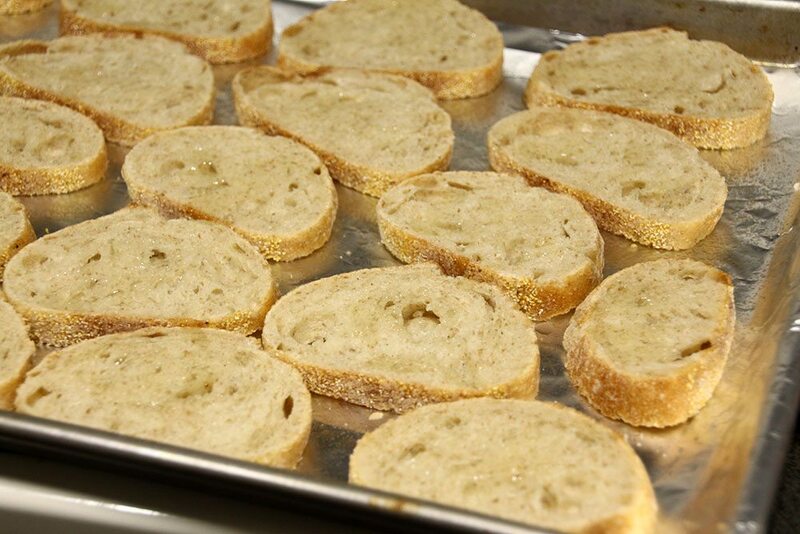 Once you take the bread out of the oven, rub each slice with the halved garlic. In a skillet, saute the olive oil and minced garlic for about 30 seconds, or until fragrant. 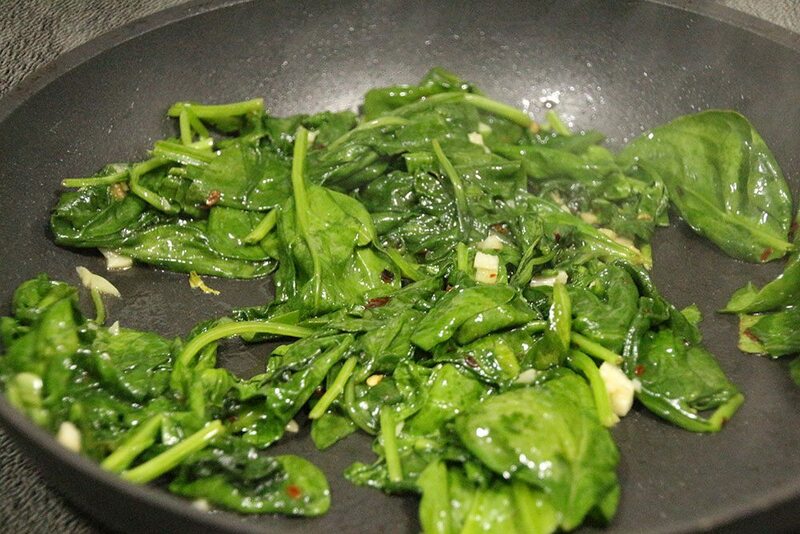 Add in the crushed red pepper, and spinach and cook until the spinach has wilted. 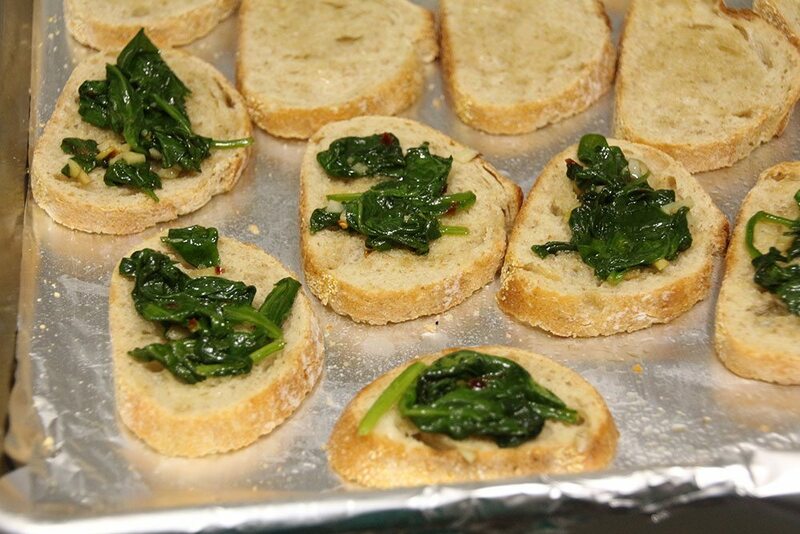 Top each slice of bread with the spinach mixture. Top the bread with the cheese. Return to the oven and cook 5-8 minutes, or until the cheese starts to bubble. I just happen to have every ingredient I need for this recipe. Can’t wait to try it. Thanks for sharing. These look so delicious! Definitely taking them to the next dinner party I go to! 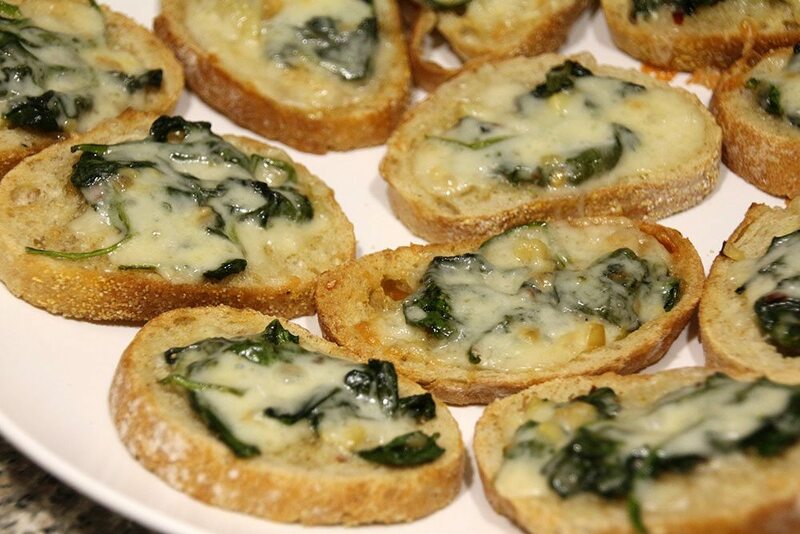 These would be wonderful as an appetizer course for a dinner party… love the addition of spinach, that bit of color is great! These look so impressive – but the recipe gives me hope that they are one of those “looks hard but isn’t” which are my favorite. Great SRC tailgate pick! These look very good to have with a beer at a game or with a glass of wine over an Italian dinner. Great choice for reveal day! You chose a great recipe for today’s themed reveal, though! I have a carton of spinach in my fridge, too! Guess I know what I’m going to do with it now. They look delicious! Great for any type of party and quick and easy to make. Great recipe for the SRC! Thanks for the kind words and so glad you enjoyed them! Yours look delicious. Oh yum. 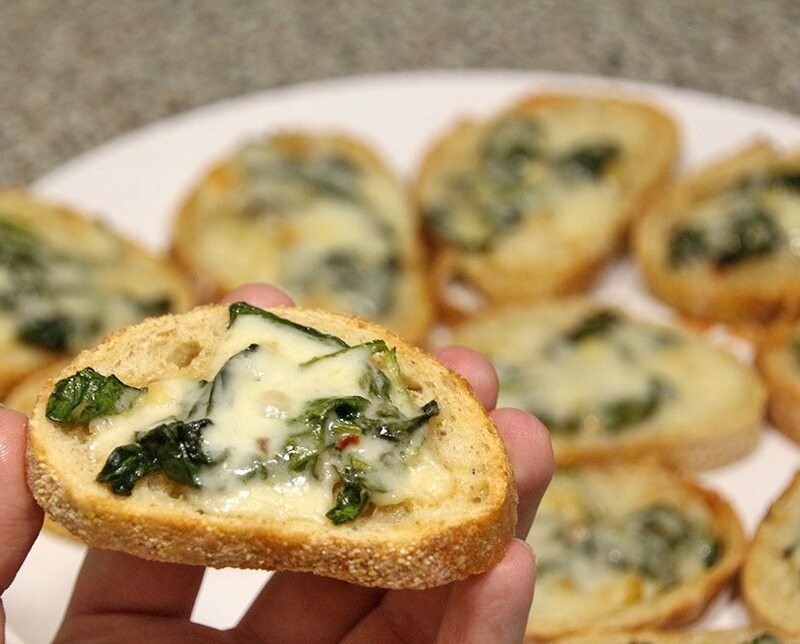 Spinach and cheese is one of the best combinations ever. I would eat waaaay too many of these too!